ENTHUSIASM, if not waves, won the day when teams of surfers descended on Pines Beach, Shoreham for the second annual DSAMP Champs contest. Dressed “in wild costumes to match the occasion”, the surfers had to be content with beach games in their efforts to compete against one another. Rod Jones, of the Disabled Surfers Association Mornington Peninsula (DSAMP) said the “offbeat” competition attracted 15 teams. Organised by the Peninsula’s Maladiction Longboarders Club the event raised $2700 for DSAMP’s surfing days at Point Leo, the second Champs event Champs on Sunday 10 November saw surfers dressed as animals, pirates, 1960s rockers, 1970s dudes, a “very hairy Snow White with his dwarves, Mexicans, Where’s Wally, monkeys and a banana, superheroes and even a couple of sharks”, Jones said. “With little to no waves on offer the event kicked off with a series of beach games, ranging from nearest to the pin golf to six–legged races where all members of the four-surfer teams were tied together by the legs and told to run. The paddle race with a Mick Pierce semi-gun surfboard first prize was won by Tony Reid. “The lack of waves turned out to be a bonus, as everyone could be involved all the time rather than waiting around for their surf heat,” Jones said. Major prizes were drawn from a hat, giving every team an equal chance of winning. 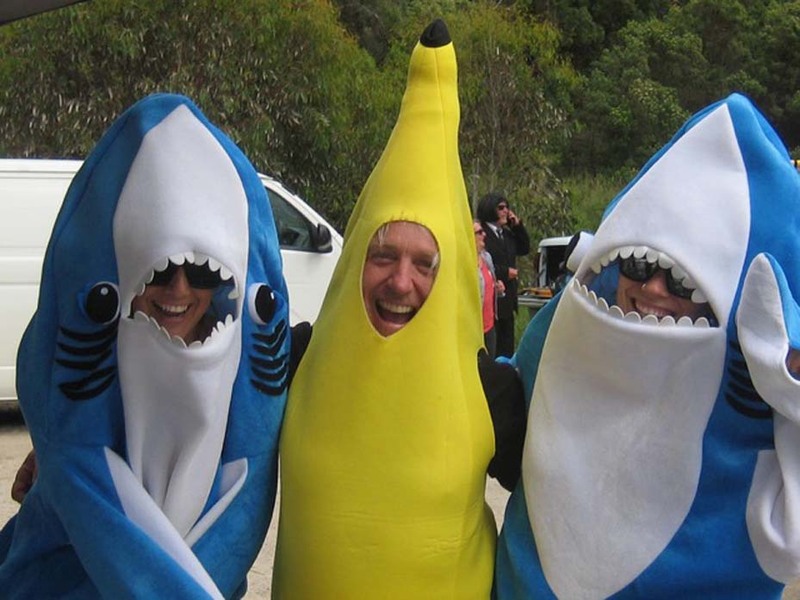 A dinner for four at Stillwater Restaurant (donated by Peninsula Speech Pathology Services) was won by the Sea Sirens, a team which also won best costume for its shark suits. Sponsors included Bass Surfboards, Trigger Brothers Surfboards, Golden Breed Flinders, Jetty Road Brewery, Crittenden Estate Wines, and Dromana Estate Wines. The next DSAMP surf days will be held at Point Leo on Saturday 12 January and 5 March 2019.